“George Duncan is an American living and working in London. At forty-eight, he owns a small print shop, is divorced, and lonelier than he realizes. All of the women with whom he has relationships eventually leave him for being too nice. But one night he is woken by an astonishing sound—a terrific keening, which is coming from somewhere in his garden. When he investigates he finds a great white crane, a bird taller than even himself. It has been shot through the wing with an arrow. Moved more than he can say, George struggles to take out the arrow from the bird’s wing, saving its life before it flies away into the night sky. This sentence perfectly captures the feeling of this book: it’s mysterious and magical and beautiful, yet utterly honest and authentic at the same time. As shown in this quote, Patrick Ness is a masterful writer who knows how to say ordinary things in the most stunning ways. Great writing is something I really appreciate and admire, so this book definitely earns some bonus points for that! I love when characters are easy to relate to, and The Crane Wife absolutely does not disappoint in that regard. George, the main character, is flawed but really easy to connect with as a result. He’s kind-hearted, selfless, and loyal, but also sort of stuck in his same-old routine day after day. My favorite character in this book, though, is actually George’s daughter, Amanda, because her inner struggles are ones that are so innately human. She’s lonely and just wants to be understood, and I think those are two things that everyone feels at some point in their lives. Her raw emotions and vulnerability expose her true personality to the reader, and show how incredibly strong she really is inside. This inner independence makes her stand out from many other female characters found in contemporary literature, and her character development is truly something to be applauded. With characters like these, it’s hard not to be captivated by this story. The story itself is so interesting and unique that it’s actually quite difficult to explain what it’s like to someone who hasn’t read it. It’s modern in setting yet traditional and aged in its feel, if that makes any sense at all. The basis of the story is a Japanese folktale, and you get bits and pieces of it as the story progresses. I really loved the magical realism that Patrick Ness does so well, and the mystery surrounding Kumiko makes the story surprisingly suspenseful. The ending was, in a word, epic- I definitely did not expect that much action! It got a little confusing as the story connected more with the mythology, though, and I found myself going back and rereading some parts a few times for clarity. 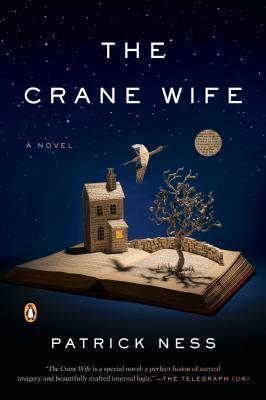 Overall, The Crane Wife was a heart-warming, heart-wrenching, and thought-provoking novel. The wise words of Kumiko and the honest confessions of Amanda have stayed with me ever since I finished reading this novel, which is the sure sign of a good story. I cannot wait to read more of Patrick Ness’ work in the future! Would I recommend it to a friend? : Absolutely! Especially if they liked his YA books or magical realism in general. Have you read this book before? What are your thoughts on it? What other books by Patrick Ness would you recommend? Let me know in the comments section below! Next > I Spent a Night at College for the First Time… and Survived!! Aww, thanks so much! 🙂 I really appreciate it! Thanks for the lovely review. I really love Patrick Ness’ other books, so I’m going to have to pick this one up. He is just so talented! He definitely is! 🙂 How do you like the Chaos trilogy? I’ve never read it, but it’s on my TBR list. I haven’t quite started the trilogy yet but it’s right at the top of my TBR list! Hopefully I’ll get to it soon!! !